It was a great final with some fine golf played by both players along with a few tired shots as the four rounds started to take it’s toll. At the turn Joe was two up which became 3 after the tenth. Ben dug deep to take the next but both played the next two to par and it was back to three. Ben fought hard and took the sixteenth and then had a chance on the next to take it down the last but once again he saw his putt just lip out and that was that Joe was this year’s Champion and once more ben was the runner up. This was a great match which concluded a great weekend’s golf played by all our young up and coming golfers. Sam was giving nine shots to last year’s runner up Ben Graham and was always going to be up against it, but how a game can turn quickly, he came down fifteen three down and promptly won the next two holes and when ben found the bunker off the next tee Sam had every chance to bring it level it was not to be and suddenly Ben had a 2 footer for the game which slipped by. Onto the last and Sam hit one to around two foot and with Ben’s putt lipping out it was all square, the shot on the first extra hole was the telling factor and Ben was again in the final. There was some fifteen shots in this and Joe was playing so well it was always going to be a challenge for Mark, Joe was up by two after two but two birdies on the third and fourth it was all square. Joe then took back the initiative and was up until the final few holes and as they came down seventeen Mark was one up and in control but nerves seem to take over and the putt to win just slipped by so to the last and mark found the green whilst Joe found the bunker. Joe just managed to get the ball out leaving a 20 foot putt which he duly sunk leaving mark thinking why did he rush his putt past by some 3 feet which he then missed! Joe then took the match on the third extra hole. After a week of rain and all courses suffering it was good to hear that we could play thirteen holes to complete the last of round of this year’s Peter Alliss qualifiers. This round was important to a lot of the players fighting for a place in the top sixteen and no more so than local Ben Graham who produced a great 39 points which just managed to secure him 16th spot in the overall placing on count back. This was equalled by the Under 14 Captain Adam Harris which secured him the top spot overall. One of the youngest members Aiden Holloway put in a splendid 38 points missing a top sixteen spot on count back to Ben, we wish him well as he went off to play in the Ezgo Junior Tour event at Sturminster! Oh to be young. So we now move to the finals at Ferndown on the 6 & 7th April where the top sixteen will battle it out during the weekend to find the Peter Alliss Young Masters Champion. I would like to thank all the players for supporting this year’s event, also big thanks go to all the parents who have transported and shepherded the young ones to these events. Well a dry sunny day even if a little cold saw the youngsters at Sturminster for the third round of this year’s Allis There was some great scoring and it was nice to see some of the really young playing well like William Chesterman from Yeovil who had 43 points. Sam Brooke Parkstone and Matt Dare Christchurch both had 42 points with young Bill Hathway taking the runner up slot with 45 points one behind the Under 14 Captain Adam Harris Yeovil who amassed 46 points. We go to Weymouth for the final round before the top sixteen take to the match play phase. Well done to all the players. On day when the actual weather on the day was far better than that forecast we were at Bridport & West Dorset for the second round of the Peter Alliss Young Masters with the sun trying to shine and only a slight breeze but no rain! 27 young guns set off with some being here for the first time, so it was pleasing to see some reasonable scoring being achieved. Late entry and local Keiran Mulhall was an early starter and played very well coming home with 41 points some 9 better than his playing partner Adam Harris. Joe Taylor from the Isle of Purbeck had 37 one ahead of Kieran Stott, Will Chesterman and Billy Hathaway all on 36. Kailin Woodland a new player to the Dorset area had another good score with 41 points also; this was enough to put him top of the pile after two rounds in the race to make the matchplay at Ferndown as the first round winner Marcus Lovesey could only manage 28 points this time putting him into second place. We move to Sturminster Marshall next February I hope you all have a great Christmas and look forward to seeing you all then. On a cold overcast morning the first ever County event to be held at Parley Court GC got under way. 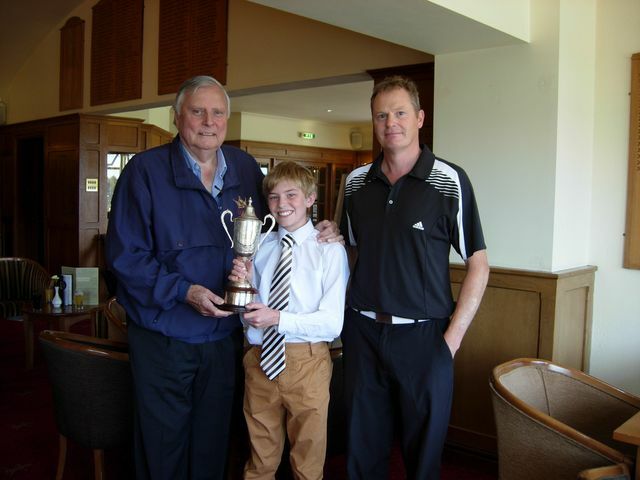 Entry to this year’s event is up from last year with a total of 27 youngsters wishing to play to become the 2013 Peter Alliss Young Master. The course was well presented and provided a good challenge for the young guns with some fine scores coming in. The best of the day came from Canford School's Marcus Lovesey who certainly had his putting boots on with a fantastic 49 points. The newly appointed under 14 Captain Adam Harris was next on 42 points with the Isle of Purbecks Joe Taylor on 40. Our sincere thanks to Parley for looking after us so well throughout the day.